Growing Up In... Uganda — STRONG. Meet 13-year-old Ndagire Fridausi as she tells us all about what it’s like growing up in Uganda. Ndagire, thank you so much for talking to us. We can’t wait to hear all about your life in Uganda! Can you tell us about your family and who you live with? Is it common in Uganda to live with just your immediate family or with extended family? I have a mother, a father, two sisters, and a brother. We are Muslims and I do love my family a lot. In Uganda it is very common to live with extended family. I have had cousins staying at our house while going to school. The reason why it is common is because some family members might not have enough money to have their kids staying with them, then other family members will help to take care of the kids. Can you tell us about the neightborhood you live in? I stay in Kyaliwajjala. Kyaliwajjala is a neighborhood in Kira Municipality, Kyaddondo County, Wakiso District, in Central Uganda. We have a good school, medical centers, recreation centers, and shopping mall around. During 2012, the Kira Municipality authorities estimated Kyaliwajjala’s population at about 50,000. Is your town typical of those in Uganda? My town is very developed by Ugandan standards. We have everything we need; shopping malls, restaurants, playgrounds, and so on. But most areas in Uganda can be less developed. It sounds as though there is a big gap between the rich and the poor in Uganda? Yes, there is a very big gap between the rich and the poor. Some kids do not attend school because their parents can’t afford it, or they only have one meal a day. We also have a lot of street kids. I’m lucky I have parents that have gone to school and are hard working, therefore my brothers and sisters and I don’t lack anything. Can you describe your home? My home is a bungalow with three bedrooms, living room, and kitchen. There are five units in a fence. We have two bathrooms/toilets in the house, one for me and my brother and sisters and the other for my parents. Our home is not a typical home in Uganda because most homes are very small and don’t have such amenities. Many homes have outside toilets or a family of five can share one room, where they sleep, have a living room, and then a toilet outside. What is the main source of income for people where you live? Where I live, most people are employed, and a few others are self-employed, i.e., business people. In Uganda though, the unemployment rate is very high at 68%. That means that many young people, when they finish school, don’t get jobs and therefore have to find a way to provide for themselves, as our government doesn’t provide them help. Can you tell us a little about the weather and climate? The weather is good and the climate is seasonal. We always have sun, and therefore we can always play outside and be outside. We don’t spend too much time inside the house. Can you talk about the geography of Uganda? Uganda is located in eastern Africa, west of Kenya, south of South Sudan, east of the Democratic Republic of the Congo, and north of Rwanda and Tanzania. It is in the heart of the Great Lakes region, and is surrounded by three of them: Lake Edward, Lake Albert, and Lake Victoria. While much of its border is lakeshore, Uganda is landlocked with no access to the sea. The country is mostly plateau with a rim of mountains. The climate is tropical and generally rainy with two dry seasons (December to February, June to August). It is semiarid in the northeast. Uganda has many national parks. Can you tell us about the wildlife that you can see around your home as well as in the parks? Uganda is one of the best countries that is blessed with a variety of wildlife. There are different national parks which are located in the different parts of the country, and each of these national parks is blessed with various wildlife. Therefore the choice is always yours, depending on the time you have to travel around the country. You can visit national parks like the Queen Elizabeth National Park, you can go to Jinja and visit the source of the Nile, you can go to the Ssese Islands which are located in the center of Africa’s largest lake, Lake Victoria. We have wild animals like mountain gorillas, hippos, elephants, lions, chimpanzees, etc. At home we don’t have any wild animals. We have domestic animals like cows, goats, sheep, and dogs. I believe the main languages in Uganda are English and Swahili. Which languages are you able to speak? I speak English. The number of individual languages listed for Uganda is actually 43. As in many African countries, English, the language of the colonizing power, was introduced in government and public life by way of missionary work and the educational system. During the first decades of the twentieth century, Swahili gained influence as it was not only used in the army and the police, but was also taught in schools. The Ganda viewed the introduction of Swahili as a threat to their political power, and partly through their influence, English remained the only official language at that time. Upon Uganda’s independence in 1962, English was maintained as the official language, as it was already rooted deeply in the administration, media, and education. Also, Uganda’s ethnolinguistic diversity made it difficult to choose another language as the official language of Uganda. After independence, there were efforts to choose an indigenous official language, with Swahili and Luganda as the most considered candidates. Although Luganda was the most geographically spread language, people outside Buganda were opposed to having it as a national language, as were those of the Buganda kingdom because they felt other tribes’ mispronunciation and grammar errors would ruin their language. English therefore remained the official language. The native languages of the Ugandan people have influenced Ugandan English. Can you talk about your education? Who goes to school in Uganda? What age do people typically stop going to school? In Uganda we have three examinable levels of education. Children usually start at the age of three and complete nursery school by the age of six. In some areas most children never attend nursery; they start their education at the age of five or six at the nearest primary school. In Uganda, there are seven primary school years, from primary one to primary seven. With normal annual progression this means primary school should last seven years, but many pupils drop out part way through and return later, so it is not unusual to find teenagers sitting for primary exams. Primary school tuition has been free in government schools in Uganda since 1997. But pupils in rural areas face serious challenges to finishing their education – for example, they lack materials, like books and pens, and they often have to study all day on an empty stomach, since no meals are provided at school. Besides government schools, there are many expensive day and boarding private schools at all levels, where wealthier or more ambitious parents send their children. Secondary school lasts six years. This has two stages; the first four years, senior one (S1) to senior four (S4), constitute the O-level period. At the end of S4, students sit the second major national exams known as the Uganda Certificate of Education (UCE) or simply O-level examinations. Students who pass their O-level exams may progress to A-levels or the Higher School Certificate (HSC). This lasts two years, S5 and S6, after which students sit for the Uganda Advanced Certificate of Education (UACE) examinations, also known simply as A-levels. All these three annual national exams are sat between October and December. However, only students who have scored 28 points or higher can be admitted to this universal secondary education program. Students who pass their A-levels may choose to progress to university, where they can study for degrees, or to other tertiary institutions that award diplomas and certificates. Some wealthier parents send their children to universities and colleges abroad. The government gives about 4,000 university scholarships each year. But tens of thousands of students who do not get the competitive government scholarships depend on their parents and guardians to pay their tuition and upkeep. Do equal numbers of boys and girls go to school? Uganda overall has a strong legal framework protecting the right to education as a fundamental human right enshrined in the 1995 Constitution. Nevertheless, Uganda has made mixed progress towards gender equality in education. In primary education, gender parity is at 91% of the school-age population being enrolled. However, female literacy rates lag behind at 49% compared to 69% of males, and gender gaps widen at secondary and tertiary school (OECD, 2015). There are many factors that contribute to women and girls’ education in Uganda and to girls dropping out of school. Data from the Ministry of Education and Sports shows that school dropout in the country is higher at the primary level than at secondary level because of lack of interest, pregnancy, early marriages, hidden costs at school, and family responsibilities. Research has found that adolescent pregnancy and early marriage remain two of the main barriers to girls’ education. We’d love to know more about YOUR education! Can you talk about where you go to school? In my school we have mixed ages, we wear a uniform and I do 15 subjects­­— Mathematics, Chemistry, Biology, Physics, English, Literature, Geography, History, Religious studies, Arabic/ French, Computer, Entrepreneurship, Fine Art, Commerce, and Accounts. My favorite subjects are mathematics, chemistry, and physics. Wow! That’s quite a list! Do children/ young adults work outside the home? Do you have a job? At least 20 million children aged from five to 17 years are engaged in child labor in Uganda. It’s very common that children can get forced out of school to help supplement income of their families and are denied the opportunity to acquire necessary knowledge and skills to aid them to get decent employment in the future— leading to the poverty cycle. For myself, I don’t work, none of my sisters and brothers work. What chores/ jobs are you expected to do to help out around the home? At home I have to wash utensils, clothes, clean the house­­—mopping the house, cleaning the bathrooms, and at times cook food. Do you have easy access to the internet? I don’t have access to the internet. Internet is very expensive in Uganda, grown-ups have access to the internet and not kids. Can you tell us about traditional aspects of your culture? We don’t have a national dish. Most tribes in Uganda have their own speciality dish or delicacy. Many dishes include various vegetables, potatoes, yams, bananas, and other tropical fruits. Chicken, pork, fish (usually fresh, but there is also a dried variety, reconstituted for stewing), beef, goat, and mutton are all commonly eaten, although among the rural poor, meats are consumed less than in other areas. Main dishes are usually centered on a sauce or stew of groundnuts, beans, or meat. The starch traditionally comes from ugali (maize meal) or matooke (steamed and mashed green banana) in the South, or an ugali-like dish made from millet in the North. Ugali/posho is cooked up into a thick porridge for breakfast. In my culture our traditional wear is a gomesi for ladies and kanzu for men. The kanzu was first introduced to the Bugandan Kingdom by Arab traders in the first half of the 19th century. It is believed that Kabaka Ssuuna, who is said to have reigned between 1832 and 1856, was the first Kabaka to wear the tunic. It initially remained a dress of the highly-placed in society. It was for those who could afford to get it from the Arab traders and people living in the Kabaka’s court or the homes of chiefs. 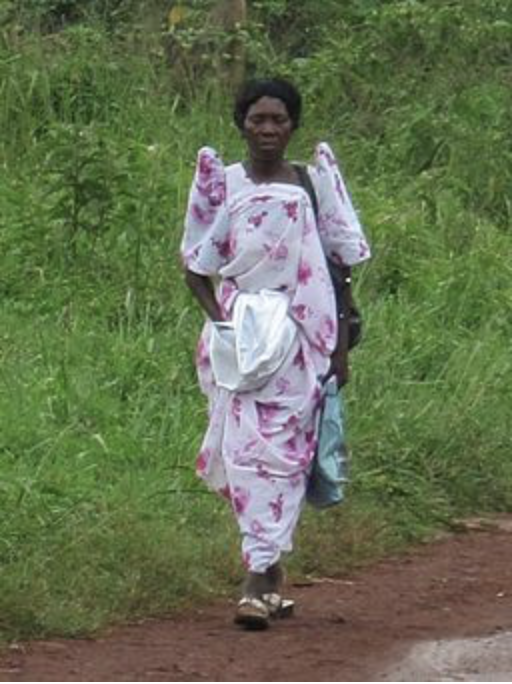 The gomesi, on the other hand, is the kanzu’s equivalent for Ugandan women. The gomesi is a much more recent addition to the culture of Buganda and Uganda. But it has become equally symbolic and more representative since it is native to and only found in Uganda, while the kanzu is not. The gomesi’s standard form is traced back to the 1940s when it was designed as a uniform for Gayaza High School. It is reported that the missionaries at Gayaza found the Kiganda tribal attire worn by the students to be indecent as it exposed the torso. The school administration thus enlisted the services of an Indian tailor from Goa, Fernando Gomes, who was based at a trading center near the school to design a dress. The dress would also get its name from that tailor. Apparently, Gomes was tasked with maintaining aspects of the Kiganda outfit so he had to come up with a compromise between Western fashions and the Ganda sheet of cloth wrapped around the body and fastened with a small strip of cloth tied around the waist. We also have clans and in my clan I am a princess. Holidays do exist but they are celebrated at national level. But we do have Christmas and Idd celebration which are home-based. Is religion a big part of Ugandan life? Yes, to small extent one has to be attached to a certain religion depending on the family where one comes from. Do you have access to western music and television at all? Yes, I have access to western music and TV, both at home and school. Can you talk about the government of your country? Uganda is a Presidential republic and a democracy. A person who is above 18 years is allowed to vote. We have presidential votes every five years. Do you feel there are disadvantages/ advantages to being female in Uganda? Honestly, there are no advantages to being a female in Uganda, but the disadvantages are many. Some girls do not go to school when they have their menstrual periods. In some homes it’s only the boys who are taken to school. When it comes to inheritance, boys are considered mostly. If people wanted to learn more about your country, is there a movie or book that you would recommend? The movies The Last King of Scotland, and Queen of Katwe and the book Kintu by Jennifer Nansubuga Makumbi. I’ve actually seen both of those movies and they’re great. Finally, can you tell us what you love the most about your country? I love Ugandan food because it is fresh and I also love the weather! Ndagire, this has been so fascinating. Thank you so much for talking to us and giving us an insight into what it’s like to grow up in Uganda. Older PostSAY HELLO TO YOUR NEW STRONG GIRL PRESENTERS!